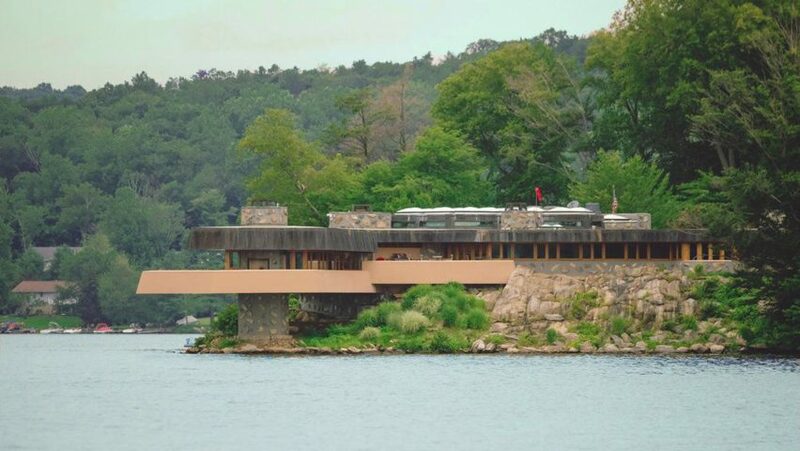 Yours for $14.92 million (£11.6 million), the heart-shaped Petra Island sits in the middle of Lake Mahopac – just 15 minutes from Manhattan by helicopter. On its western edge is a house that was built to the late modernist architect's final drawings during the 2000s. Now complete, the larger building is anchored by a series of stone pillars, supporting thick horizontal planes – reminiscent of Wright's Fallingwater house – that extend out over the lake from the rocky shore. Large windows wrap around the majority of the home's exterior, while even more light is brought into its centre by a triangular-latticed skylight. The site's stone outcrops are incorporated into the interior, which is lined with large expanses of cement and mahogany. It remains an unofficial Wright house, as the foundation that oversees the architect's estate has refused to certify it, and even sued Massaro over its authenticity. Wright has remained one of architecture's best-recognised names ever since his death in 1959. However, this year saw a renewed surge of interest in his work as part of celebrations for the 150th anniversary of his birth. These included a series of events at the architect's projects across the US, and a major exhibition of his drawings and models at New York's MoMA. Dezeen marked the occasion by looking back at Wright's most pioneering works, including the Guggenheim museum, Unity Temple and Johnston Wax Headquarters.